Andrew Gwynne MP took on the challenge of cleaning up the streets at the Labour Party Conference last week, when the charity Guide Dogs offered him the chance to learn more about the daily difficulties faced by people living with sight loss. The charity used a unique twist on the fun-fair game, Hook-a-Duck, to highlight the campaign and Mr Gwynne became the guide when he helped a rubber duck navigate a stream full of obstacles. 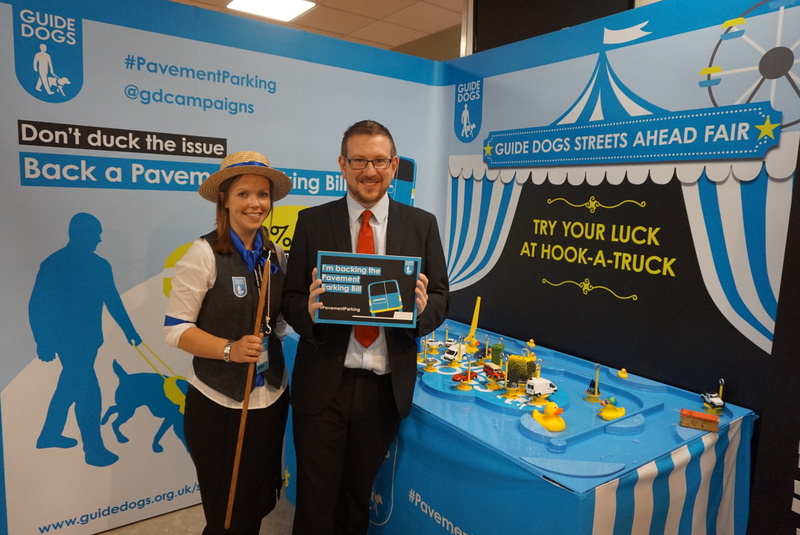 The MP for Denton and Reddish is supporting Guide Dogs’ campaign on pavement parking, including a proposed law to restrict it to designated areas. “Parking on pavements is blighting Britain’s streets. It puts all pedestrians in danger, particularly those living with sight loss.